Ambulatory Surgical Centers Market size is set to exceed USD 92 billion by 2024; according to a new research report by Global Market Insights. Rising prevalence of chronic diseases coupled with technological advancements enabling development of sophisticated medical devices will favor the industry growth over forecast period. Such medical devices enable ambulatory surgical centers to offer superior quality treatment at an affordable price. In response to the increasing healthcare cost burden, regulatory authorities are further supporting development of such devices that is predicted to impact the ambulatory surgical centers market growth. Physician only segment of ambulatory surgical centers market is forecasted to grow at a robust CAGR of 4.9% as it offers superior and convenient treatment to the patients both as single specialty as well as multispecialty facilities by collaboration with different physician. Minimum overheads, greater control over clinical environment and favorable reimbursement policies will drive the segment growth over forecast period. Orthopedic segment is estimated to grow at a robust CAGR of around 5% from 2018 – 2024. Increasing incidences of bone related diseases like osteoarthritis and osteoporosis will drive the segment growth. Moreover, increasing accidents and trauma instances across the globe will drive the number of orthopedic surgeries being conducted at ambulatory surgical centers. Increasing chronic disease prevalence coupled with the preference of patients towards minimally invasive therapies will augment the multispecialty segment growth over forecast timeframe. Moreover, growing trend of Medicare spending on ambulatory surgical centers for various procedures such as lumbar spine and hysterectomy will drive the segment growth. U.S. ambulatory surgical centers market was valued at over USD 25.5 billion in 2017 and is anticipated to witness considerable growth over the forecast period. Increasing prevalence of diseases, rising healthcare spending and rapid penetration and adoption rates of minimally invasive therapies will fuel the demand. 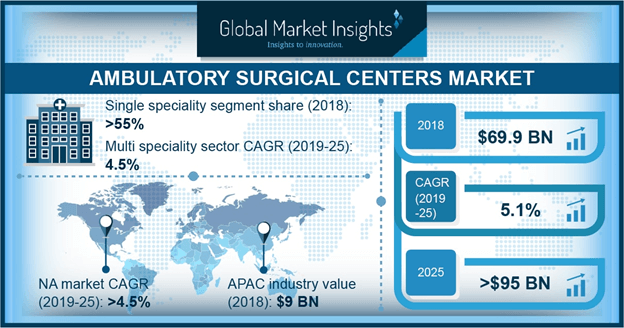 Moreover, availability of developed infrastructure, and advancements in technology will further driver the ambulatory surgical centers market growth. Some of the key industry players in ambulatory surgical centers market are ASD Management, Ambulatory Surgical Centers of America, Covenant Surgical Partners, Physicians Endoscopy, Hospital Corporations of America, AmSurg, Surgery Partners, SurgCenter Development, Surgical Care Affiliates, Regent Surgical Health, Surgical Management Professionals, Proliance Surgeons, and Tenet/USPI. Industry players are taking initiative to acquire higher market share and revenue. Technological advancements leading to the development of cost effective solutions coupled with increasing inflow patients from hospitals to ambulatory surgical centers will drive the industry growth.